Shock pals Brad Keene and Brian Collins (over at Badass Digest) alerted me to a story that's too weird not to share with the rest of you. It seems there's a bus stop in England that's being called "home" by a lone copy of Hellraiser on VHS. 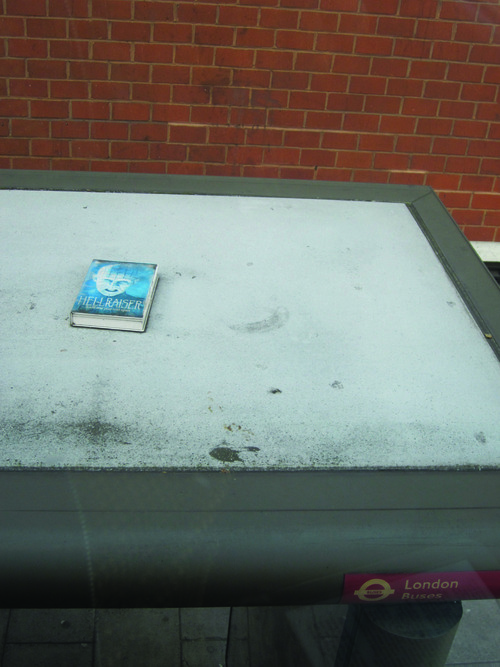 That's a photo – courtesy of Peckham Peculiar – of the VHS which was reportedly first spotted on top of the bus stop in London. The copy has come and gone…and no one knows its story. A Twitter chronicle of this Hellraiser VHS' story is amusingly recounted via Timeout. Basically, there was one copy spotted. Then two. Then both went missing. Then one appeared. It was replaced and so on and so on and so on… The VHS has suffered weather damage and one tweet even says the cover had blown open only to reveal Hellraiser II was inside. A tree apparently fell near the bus stop. A bicyclist claims he fell off his bike near there.